This release contains many enhancements and bug fixes that improve the robustness and overall usability of Manuskript. Download, install and learn how to use Manuskript to write a fiction novel today! Manuskript is available for Linux, Windows, and Mac OS X. Extra export formats such as ePub, OpenDocument (LibreOffice), and DocX (MS Word) are available in manuskript if you also install pandoc. More information can be found on the Manuskript Wiki. Improvements in this release can be found in the ChangeLog. This entry was posted in News, Releases. Bookmark the permalink. I love Manuskript. It’s full of all the features I ever wanted from a free writing software. I’m having a small problem: I’m using Windows 10 to run the software, and for the most part it’s fine, but the World tab is rather difficult to use. Most particularly, I’m incapable of being able to reorganize individual items, which I feel should be standard for just about every outliner. Thank you Tenner for your interest in Manuskript. We track suggested improvements and enhancements on the project github Issues page. Currently there is an issue open for your suggestion: Issue #219 – Moving World Items. Other improvements are also being worked on regarding worlds such as Issue #244 – Focus should change when creating a new World / Plot / Character. You can test the work in progress if you install the source code and run the latest develop branch as described in the Manuskript Wiki. Thanks for the update. Used for a day, however the next day (now), Manuskript does not load at all. The CMD window comes up and does a few things, but exits before I can read why the program won’t load. Reverted back to v0.5.0 and that does not load either. I’ve also tried loading a different set of the same files (for each version) in case it was a settings issue. Just to make sure I’m using the download files correctly, what I do is download the Windows package (using Win8.1) and copy the files to my Programs (x86) folder. Is there a new software requirement? I’ve only been using the base package with no add-ons. There have been no new software requirements added between manuskript 0.5.0 and 0.6.0. There is an optional requirement to install Pandoc, but this does not affect the ability to open, save, or close a manuskript project. Invoke manuskript by typing in manuskript.exe and press Enter key. Copy the output from the command prompt and place it in a new issue that you create at Manuskript Issues on Github. We can then continue the conversation and try to figure out how to get manuskript working again for you. For my own reference as well as helping others who experience this problem, my issue was that I had renamed a scene a long name, and Manuskript could not save/open the .msk because the folder-and-file-name for that scene was too long. I was able to open the .msk again be moving it to the desktop (for the shorter path name) and renaming my scene to something shorter. I’m really anxious to try this product. It seems exactly like what I’m looking for. However, I went to download it and can’t find the manuskript folder referenced in this portion of the instructions for Mac installations : “In the newly created manuskript folder find the file named manuskript and double-click on it…” Where would this folder be located? I’m running macOS Sierra vs 10.12.6. When the manuskript-0.6.0-osx.zip file is unzipped, the contents will be extracted into a folder named manuskript. Usually this manuskript folder will be in the same directory that contains the zip file, but can be moved to a different location if desired. I feel kind of behind now. I’m still running 3.0 and I love it. *clings to old version* I’m not going to lose everything if I decide to upgrade, right? I only ask because I have a ton of stuff and there are a few bugs I have to tiptoe around (I realize you don’t do support for older versions, so that’s why I ask). We recommend you make a backup of your manuskript project(s) first. Older file formats *should* load and be updated to work with newer Manuskript versions. Thanks for updating Manuskript! It’s my favorite writing software for fiction with every feature I’d ever want but last time I tried it on version 0.3 it crashed often. I’m glad to see that development is still going forward. Just discovered the existence of Manuskript and I am rather eager to try it out. So far, I have been using a simple and versatile software for almost all of my journalistic writing — KeyNote NF, a tree-plus-tabbed-notes software. It has served my purpose wonderfully, and I will indeed continue to use it for a lot of note-taking etc. However, there are some things professional writers and editors like to do often that KeyNote NF does not allow, such as: a) Working with sticky notes or index cards which can be shuffled about to evolve a structure for the piece b) Creating a visual timeline and storyline (One can create a separate tree-form note to use as a timeline, but it doesn’t link up to the notes and the nodes representing the scenes. Perhaps one could create internal links, but it’s all too clumsy and time-consuming.) c) Keeping track of people, places, and things scene-wise. I had heard of Scrivener and some writer friends recommended it too. In doing my research before buying it, I found there were certain things the Windows version could not do that only the Mac version would allow, such as a freeform corkboard where one could move the index cards about without them jumping back to the place the program has assigned them. 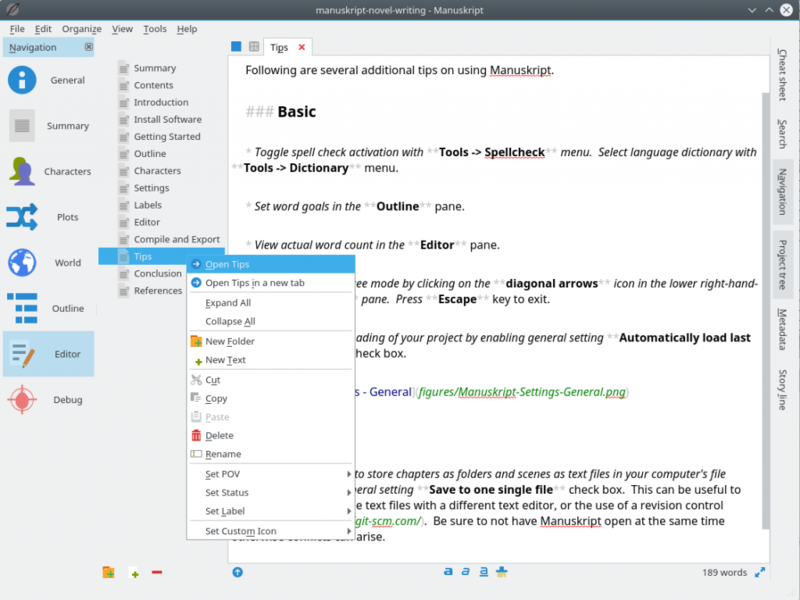 I stumbled upon Manuskript while trying to learn about alternatives to Scrivener and found it appealing in that, for a FREE software, it offers so much.So I am writing to thank the developer/developers who have brought it from Version 1 to Version 6. In a time when the value of words and word-craft is diminishing rapidly, this is a catalyst to help those who value verbal creativity and the creation of texts — fiction and non-fiction. I will be honest and say that since I have been using a pretty basic software (KeyNote NF) so far for taking notes and planning all my writing, I’m a bit intimidated the profusion of features Manuskript offers. What attracts me, though, are the built-in corkboard-and-index-card feature and the timeline/storyline features. I will be trying Manuskript out soon and hopefully, using it for all my writing needs. Very good software and very promising! It really misses the possibility to change the font (italic, bold, underlined) in the same text. Manuskript uses an open and plain-text file format to control formatting in the compiled/exported file. Currently Markdown language is the best supported with editor highlighting. For examples of how to use Markdown language see Markdown Cheatsheet. Manuskript is almost exactly what I was looking for. Almost, but far nearer than I expected at first. Maybe this wanted feature would be nice, or maybe that one would be better. Or maybe not, I’d rather add this one… Yes, all you could add (in case there are still feature that are not present) would be fine, but my only request is to hunt the bugs. It’s my fear everytime I play with the timeline, when i try to export a pdf (not your fault, but Pandoc has changed and do not accept “–smart/-S” anymore) or when I chnage to fast the views. Manuskript is wonderfull. Just make it better hunting these bugs. Please. The Manuskript project is a volunteer effort. We welcome assistance with hunting down bugs. The issue you mentioned is currently tracked as Issue 304 – pandoc v2 has deprecated some options and extensions so manuskript is giving error. A work-around to this issue is to downgrade pandoc to version 1.x, for example 1.16. Been a while since the last update. What’s up? Manuskript is a volunteer effort and progresses based on when the volunteers have free time. If you wish to explore new features currently in development then you might consider running Manuskript from source code. See the Manuskript Wiki instructions for your Operating System. I’m trying Manuskript and I can’t import any document. They are .docx document. I download pandoc but it did not change anything. Wow, amazing software. Everything I wanted in a writing program. keep up the good work, I can’t wait to see what features you have coming in the future .